I got home, and noticed that a book had arrived that I ordered a few days ago. Sweet! I set it aside, and went about my evening. Later, I picked it up and started thumbing through it. What did I flip to on page 37 of my new book*? Ummm, yeah. Maslow’s Hierarchy of Needs. My balloon of creativity immediately deflated. My moment of sheer genius was a fraud. Hopes dashed. Someone made the connection (and got it into print) first. Then, being ever-optimistic, I justified that since I didn’t know about this until AFTER I had my epiphany, it still counts. Regardless of who thought of it first, it is so true. New employees need to be nurtured and given the opportunity to incubate, learn, and grow in a way that meets these different phases of acclimation. At the very minimum, we need to let employees know where to get a drink of water or use the restroom. Where their desk or office is. What tools they have available to do the job. Then, make the employee feel safe – both physically and emotionally. Help them feel accepted and a vital part of the team. Reaffirm the decision to join your company! As the employee progresses along the path, give them feedback and opportunities to show their stuff. All of these details help those new employees reach the phase of self-actualization; in onboarding terms, that might mean productive…satisfied…proactive…loyal. It makes sense, doesn’t it? 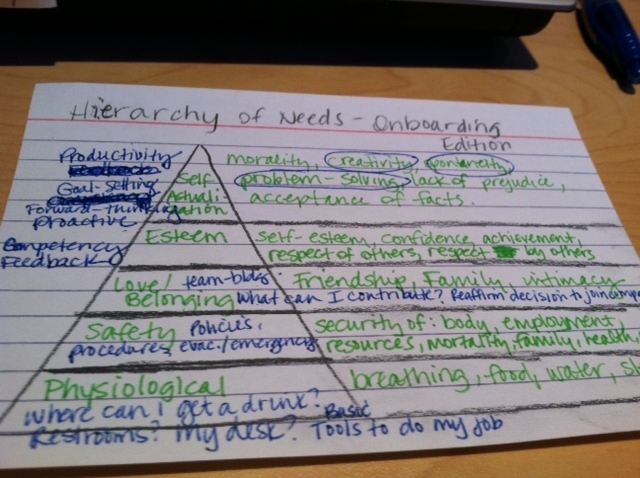 I’m not sure that Maslow had workplace learning and development in mind when he crafted his Hierarchy. But it’s a lesson learning professionals can take away when creating learning opportunities for new employees. Give them the tools they need to be successful. Ensure that their needs are met. Make them comfortable and confident that they joined the right team. As always, I’d love your thoughts; either from the perspective of a learning professional, or as a new employee. Do share! My website has a lot of exclusive content I’ve either written myself or outsourced but it looks like a lot of it is popping it up all over the web without my agreement. Do you know any ways to help protect against content from being ripped off? I’d genuinely appreciate it.